"RIPPLES" Blog — HELPING HEARTS & HANDBAGS, INC. When I was around ten years old, my father taught me how to skim stones on a pond. First we had to find the perfect stones... flat and not too heavy. I remember spending a really long time looking for those perfect stones because I wanted to spend as much time with my dad as possible. Like many men from his generation, he worked and commuted long hours and on this special morning, it was just the two of us which was heaven to a little girl. "Throw the stone more with your wrist, and less with your arm," he patiently coached as my first attempts went straight to the bottom of the pond. Each time he showed me, his stone would gracefully bounce on top of the water, again and again, making beautiful ripples in the still water. I loved watching how each ripple eventually found another, connecting into bigger and bigger circles before slowly fading away. The first time my stone went airborne for a couple of skips, he picked me up and gave me a big hug. We cheered so loud that my mother came down from our campsite to see what all of the fuss was about. She took a few pictures to commemorate our "stone-skipping" success and it's a memory I've cherished my whole life. Especially now that my father is skipping stones up in heaven. So why share this story for my first Helping Hearts & Handbags, Inc. blog? Simple. It's about ripples. Ripples on top of a pond that eventually all connect to one another into something larger. Each time I look into a homeless woman's eyes as I hand her a purse filled with items she needs to get through a day, it's a ripple... a "ripple of kindness". It reaches out to a woman who needs a helping hand and lets her know there are other women who care about her. She's not forgotten, as many have told me they feel. And every time someone drops off purses and/or items; donates financially so we can buy more items to fill the purses; shares our message with co-workers, friends and family; or coordinates a Donation Station drive, Helping Hearts & Handbags, Inc. is able to create more and more ripples of kindness. I hope you'll join the "Ripples" Blog as we share stories about the MANY ripples of kindness in the world. Whether through music, quotes, personal experiences, FB posts, photographs, or messages from friends and family, there is an endless supply of love, caring, and good in the world from which to choose. I know it can be hard to see sometimes... but I promise you it's out there. We'll also keep you updated with Helping Hearts & Handbags, Inc. And if you want to share something that touches your heart, we'd love to hear from you. Simply reach out to Lisa@HelpingHeartsandHandbags.com. As I write this, my younger son, Eric, is hiking the Appalachian Trail. It’s been a bucket list item of his for many years, and before he goes back to grad school to be a high school teacher, he decided it was “now or never”. Now let me preface this story by saying that Eric has admittedly, shall we delicately say, a “challenged” sense of direction. We like to joke that he's just always busy thinking about other things and would rather be driven than have to focus on such mundane things as getting somewhere on the first try. My husband Ralph is an experienced camper having served as an Army Ranger, so he helped Eric prepare for his four month journey, even flying down to Georgia with him to get him set for his first week on the trail. While they were down there, my older son Matthew called Eric to wish him well and joked with him that “the real reason Dad’s there is to point you in the right direction and be sure you aren’t heading to Florida.” All joking aside, Ralph dropped Eric off at the beginning of the trail with a 35 lb. pack on his back, a big hug, and told him to let him know when he was settled in that night. For those of us who aren’t familiar with the Appalachian Trail (which is most of us I am guessing) it’s marked with AT signs to help hikers find their way. After about three miles on his first day, Eric started worrying that he hadn’t seen any markers. He eventually made his way to a lovely waterfall where a group of young women were hiking. Eric asked them if they knew where the nearest AT markers were and after a few sideways glances at each other, the girls smiled and said he wasn’t actually ON the AT trail and if that’s where he was heading, he needed to turn around and start over. They didn’t judge or laugh at him (well maybe just a little) and even walked him over to the right trail back and wished him a wonderful journey. What does this have to do with Helping Hearts & Handbags? It's about being lost. My son was truly lost that day and what started out as an exciting adventure took an unexpected turn. It was the kindness of strangers that helped him back on the right path… literally. Had he not come across those caring young ladies, he would have walked further and further into the woods. The women that we meet and serve through Helping Hearts and Handbags are oftentimes lost as well. Somehow, somewhere, they have taken a wrong turn and ended up on a path I am sure none of them expected. It’s not for us to judge because we CAN’T possibly know the stories behind their choices, their lives, or their struggles. But what we CAN do is give them a lovely purse and some personal care items, donated by caring women, to restore a little dignity. And a handwritten note tucked inside the purse reminds them that they are valued and that other women care about them. Because the truth is we have all been lost at one time or another. I know I sure have. Sometimes it’s simply while driving or walking. And, other times, it’s more serious during difficult life situations when you have to decide the right path. It can be a nuisance or it can be very scary. But one thing always remains true: the kindness of a stranger can make all the difference. So to wrap up my son’s story, every hiker on the Appalachian Trail is given a nickname by fellow hikers, like Walkabout Joe, Sunshine Sue, or Grandpa Ed. Once Eric found his way onto the actual Appalachian Trail, he hooked up with a couple of other hikers and told them his first day story. 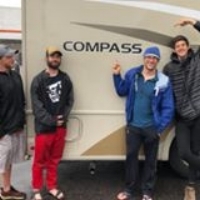 It was quickly and unanimously decided that Eric would forever be known on the AT as “Compass”. Here’s hoping that Compass keeps his eyes open for all of those markers and if he needs help along the way, a kind stranger will appear on his path once again.